In supporting Occupy Central and opposing the Sunflower Movement, Ma Ying-jeou suggests the ends justify the means. This problem relates to my argument in a previous essay. Democracy is a good thing, but we need to seriously consider what kind of democracy Hong Kong needs and, to go even further, what kind of democracy China needs. More importantly, how can this democracy be realized peacefully and lawfully? These are the very issues that cannot and should not be decided only by the minority of people now occupying Hong Kong’s public facilities, much less by commenters in the Western world. The Republic of China (ROC) on Taiwan has developed and become a full-fledged democracy over the decades. Taiwan and Japan are the only entrants from Asia listed as “Free,” in the Press Freedom Rankings published by US-based Freedom House. A democratic government tolerates differences of opinion, fosters dialogue, resolves disputes, and engenders social stability. The ROC stands as an eloquent testimony to the truth of this statement. 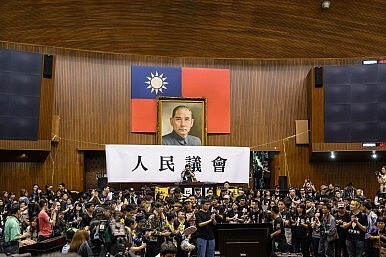 In the case of the Sunflower Movement in Taiwan, President Ma Ying-jeou applauded students’ passion and motives; however, the act of occupying government offices is not acceptable. After all, the rule of law is the basis of democracy; without the rule of law, there would be no democracy. Based on this principle, Taiwan government had responded to students’ demands positively and peacefully. With regard to the pro-democracy demonstration in Hong Kong, President Ma has said that the ROC has had universal suffrage for quite some time, so it fully understands and supports the Hong Kong people’s demand for universal suffrage. He urged the authorities in mainland China to heed the voices of the Hong Kong people and to adopt a peaceful and cautious attitude in handling the situation. At the same time, he hoped that the people of Hong Kong will use peaceful and rational means to express their demands. In an interview with the New York Times on October 31, President Ma reiterated clearly, “I support democracy, but oppose violence. No democratic country can allow its legislature or executive government agencies to be occupied by anyone, including students. That’s violence, not democracy.” He also stressed that if mainland China can practice democracy in Hong Kong or if mainland China itself can become more democratic, then this would be a great step toward creating closer cross-straits ties in the long run. What President Ma supports is the hard-won democracy and the rule of law. How Beijing handles the Hong Kong protests will impact Taiwan and the cross-strait relationship.